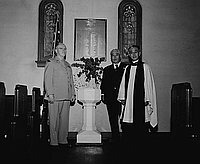 Plaque dedication of World War II casualties of members at St. Mary's Episcopal Church in Los Angeles, California, May 28, 1950. Plaque hangs between two stained glass windows above a white wreath atop a pedastal next to an American flag. Typed on original negative envelope: St. Mary's Church -- Plaque Dedication of World War II Casulties of the Members.